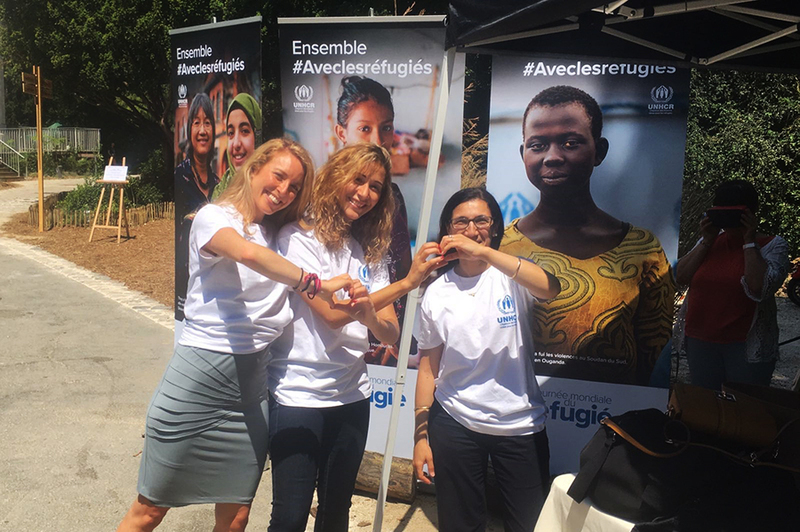 UN Volunteer Kamilia Lahrichi (France, centre) served as UN Volunteer Associate Public Information Officer with UNHCR in France. Kamilia Lahrichi (France) served as a UN Volunteer Associate Public Information Officer with UNHCR in France. With her professional background in journalism, Kamilia’s responsibility included developing communication strategies, producing web articles, press releases, reports and visual content for UNHCR France’s website and social media, as well as disseminating information to the media to promote a better understanding of UNHCR’s work in the country. Through her work, Kamilia managed to boost digital content and raise awareness of the situation of refugees in France and across the world and promote their integration among the French-speaking audience. Being more active on social networks has enabled UNHCR to reach out to news audiences and enhance its reputation and visibility. Also, writing articles and producing videos on success stories of refugee integration has positively impacted the local community as well as refugees because it has proven that host communities and refugees can live together, learn from each other and contribute economically and socially to the society they live in. Kamilia recalls an assignment in the north of France, in the city of Lille, in June 2017, to communicate about the Refugee Food Festival – a citizen-led initiative during which restaurants open their kitchens to refugee chefs to promote their professional integration and change the way people look at refugees – on UNHCR France’s platforms and with the media. Kamilia was interviewed by La Voix du Nord, the main newspaper in the north of France. She says it was very interesting to be, for once, on the other side and answering journalist’s questions. Kamila learned that the refugees are a highly important cause that deserves to be supported by volunteers, students, NGOs and policy-makers alike. Joo Hee Kim is a UN Volunteer from the Republic of Korea who is serving as Associate Field Officer with UNHCR in Greece. With her professional background in refugee protection, Joo Hee has been leading community-based protection activities since her assignment began, directly engaged in planning for the activities, budgeting, implementation and monitoring the implementation of her community-based protection team and implementing partners. From beginning of this year, Joo Hee's office has shifted its focus to work on integration of urban refugees in the Greek society. To understand services available for refugees and identify potential collaboration in integration activities, Joo Hee makes visits to community centers and actors operating in the urban area. Joo Hee also monitors education and community engagement activities with local staff she coaches. She organizes and facilitates focus group discussions with refugees living in the sites and urban area to identify causes of protection issues and suggestions from the refugees. Since the refugee population in Greece is transient, due to their frequent departures and moving to other locations or countries, many refugees find it difficult to perceive themselves as a community and to find common interests and issues that they would like to address together. Joo Hee and her community-based protection team maintained direct communication with the refugees in groups divided into various age, gender, and diversity on a regular-basis. This enhanced understanding among refugees as they expressed and shared common issues and discussed about solutions and suggestions. Through Joo Hee's work, the refugees were empowered through the support to identify and address their own protection issues. Cultural exchange and integration between refugees and the host population was facilitated through various coexistence activities Joo Hee and her team organized, which were mainly visits to a scientific institute and celebrations of cultural or festive days. Joo Hee says, "At times, coordinating with all units of the operation and numerous actors and stakeholders was challenging, but I could strengthen my skills in conflict resolution and negotiation. Furthermore, I gained a thorough understanding of all the process of programming and implementation of refugee protection activities in community-based and participatory approach."